Raising the rates of influenza vaccinations among patients and health care workers is a key, yet elusive goal for many health care systems. In their role as medication experts, pharmacists can play an important role in advocating for and participating in an influenza vaccination program within the hospital setting. While it is critical that nurses, pharmacists, and physicians, as frontline staff, be vaccinated, ideally all employees in the hospital system who come into contact with patients, such as dietary or janitorial staff, should be included in the program. Taking this a step further, it could be argued that all hospital visitors and family members should be offered vaccinations as well. Although this may not provide visitors with immediate protection, the goal is to vaccinate as many people as possible, whether they are being treated in the emergency room, working in the pharmacy, or visiting a hospital patient. As most institutions look to implement a universal vaccination program for their health care workers, it is important to determine whether participation will be mandated as a condition of employment or whether staff will be permitted to opt out for medical or personal concerns. There are truly few indications for individuals not to receive a vaccine; nonetheless, it is not uncommon for hospital staff to have a poor understanding of the vaccine, its protective effects, and how it will benefit them. Any activity geared toward staff vaccination needs to employ an educational component in order to dispel the myths surrounding such programs and the safety of vaccines. Perceptions still exist that the vaccine is not incredibly effective, or that one may become sick as a result of receiving it. Some people believe that since they are young and healthy, or since they have never had influenza, they will not get it, and therefore they do not need to receive the vaccine. Some health systems currently motivate staff to participate in the institution’s influenza program through wellness incentives tied to their benefit programs. Similar to programs encouraging smoking cessation and weight loss, appropriate vaccination can be rewarded monetarily or with other benefits of value to the employee. In November 2011, the CDC’s Advisory Committee on Immunization Practices (ACIP) published their recommendations for immunizing health care workers. Among other points, they advise that administrators include influenza vaccination coverage among health care providers as a measurement of quality of care, and that influenza vaccination rates for the facility’s health care providers be measured and reported regularly. According to the CDC, individual unit and special specific coverage rates should be provided to staff and administration. Historically, one of the major barriers to universal vaccination has been supply; many facilities are allocated vaccine quantities that are insufficient for a universal vaccination program. In these cases, only frontline personnel should receive vaccination, leaving other hospital staff, such as administrative personnel, unvaccinated. When there are true access challenges, it makes sense to allocate vaccines to critical personnel involved in direct patient care. However, it is important to investigate access issues fully. Often the quantity available is a financially driven determination. To create a universal vaccination program, economic factors will come into play. Hospitals need to determine who will bear the burden of the vaccination cost. Will the resultant gains in patient safety and decreased sick days justify the investment in an expanded vaccination program? If employees are expected to pay for the vaccines themselves, will that significantly lower program participation? Although the cost to the health care institution to immunize thousands of employees could be significant, the influenza vaccine itself is not overly expensive, especially if the institution purchases it ahead of time. With appropriate upfront planning, the doses can be pre-booked before they are manufactured, at a cost of less than $10 per shot. There are many opportunities for pharmacy to drive improved patient vaccination rates. 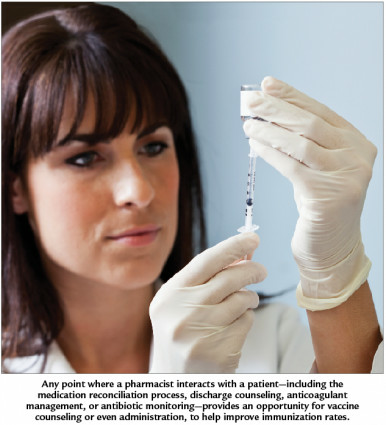 Any point where a pharmacist interacts with a patient—including the medication reconciliation process, discharge counseling, anticoagulant management, or antibiotic monitoring—provides an opportunity for vaccine counseling or even administration, to help improve immunization rates. Incorporating immunization history into the medication reconciliation process makes a great deal of sense; however, determining a patient’s vaccination history can be quite difficult. Nonetheless, we need to have a heightened awareness of vaccinations as an important component of a patient’s medical history. Staff members performing medication reconciliation should consider obtaining a complete vaccine history as a required step in the process. Train your pharmacists, interns, and any other staff responsible for reconciliation efforts on how to request information on past vaccination records, as well as how to obtain access to any records that may be available, such as those kept by the state or by retail pharmacy chains, where many individuals now receive vaccines. Primary care providers are often contacted for true medication reconciliation upon admission and obtaining a vaccination history from the PCP would add an extra step to this process. In addition to learning how to obtain such information, staff who perform medical reconciliation need to have a place to capture and store that information in the system. Standardized order sets provide an excellent opportunity to incorporate a trigger to activate an influenza protocol. Taking it a step forward, this could be part of admissions orders for all patients. Once that step has been activated and they are enrolled in the process, the appropriate screening would occur. All patients would then have the opportunity to get the vaccine, although physicians would have the option to remove it from the order set. Making this an opt out choice rather than an opt in for all patients is the preferable approach. It is important in such a scenario to ensure that patients are able to convey whether or not they already had the vaccine. Likewise, any immunization must be recorded appropriately so that the patient does not inadvertently receive an additional vaccine in the event of admission to a different institution. Following the 2009 influenza pandemic, it was found that a considerable number of patients who developed influenza went on to contract a bacterial infection with streptococcus pneumonia. Recommendations were made at that time to screen patients for the pneumococcal vaccine as well. Therefore, when patients are screened for influenza vaccination, it is a good idea to screen for pneumococcal vaccination simultaneously since they are known to present together. Incorporating vaccination initiatives into an antimicrobial stewardship program is another way for pharmacists to proactively identify patients who are immunization candidates. The argument can be made that avoiding illness altogether is the ultimate strategy for reducing antibiotic use. For patients with suspected influenza, it is important to decrease the number of unwarranted medications given to patients until a definitive diagnosis is established. Pharmacy should advocate for the use of rapid diagnostic tests both in the emergency department and as an admission tool to reduce needless antibiotic use, and improve care overall. Some patients or health care workers may refuse to be vaccinated because of a needle phobia; in these cases, they can be offered the option of receiving a virus nasal spray, a simple, non-invasive way to get the same protection. Another issue to consider is how to evaluate patients with a self-reported egg allergy. 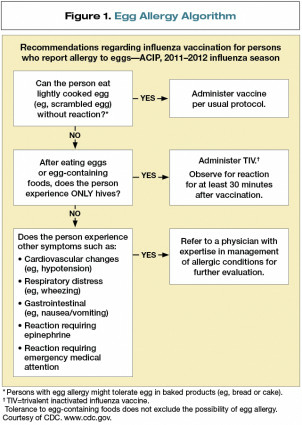 The CDC has published an algorithm on how to determine whether a patient has an egg allergy that will be affected by receiving the vaccine (see Figure 1). While mercury has not been shown to be linked to autism, and there are no known risks associated with its use in vaccine preservatives, some patients do carry a lingering fear about vaccines containing the preservative thimerosal, which contains mercury. There are preservative-free preparations available as single-dose syringes that can be offered to patients and staff with these concerns. Mobile vaccination teams often administer vaccines to health care workers within institutions, moving through different areas of the hospital during a specific time frame with vaccination supplies, required paperwork, screening forms, and so on. This approach could be extended to patients as well, wherein the mobile team would move from room to room and floor to floor to administer vaccinations. Several influenza vaccines are currently available, all of which contain the same antigens against the same strains, but they differ in the number of antigens in each vaccine formulation and the ages for which they are indicated. By ordering one or two preparations, it would be possible to cover most indications, ensure flexibility with administration, and accommodate most patient requests in terms of whether they prefer, for instance, a nasal spray or a preservative-free preparation. Many hospitals prudently carry more than one preparation so they can accommodate as many individuals as possible. The quantity of vaccine ordered will depend on economics; typically, the larger the quantity of vaccine purchased, the greater the discount. Hospitals try to make good projections on quantities to purchase based on the number of employees, bed turnover, historical data on admissions, and so on. There might be a learning curve regarding how much to purchase while institutions are implementing new programs or trying to increase vaccination rates the first year or two. While it is not always the case that vaccines are ordered in one initial batch, pre-ordering usually produces a significant cost savings, so it is in the institution’s best interest to try to do so. Most vaccination efforts gear up in October and November, and then start to slow down thereafter, even when there is still a benefit to giving the vaccine to patients later in the influenza season, such as in March or April. Vaccines will typically remain useful until approximately June of the following year, but because the vaccines change annually, use would not be recommended for the following year. It should be noted that self-insured facilities may seek to order larger amounts of vaccines knowing that they can possibly provide discounted vaccinations at clinics for dependents of their staff. However, the use of the excess vaccine will be dependent on its source; the supply of vaccines for Medicaid patients can only be administered to those patients, for example. Keep in mind that vaccines received at discounted or subsidized prices may require separate stocking and tracking processes, making it key to manage the quantities ordered from these sources with extra care. The goal of universal influenza vaccination is an ambitious one for many hospitals, but is within reach if the appropriate planning and tools are implemented. Pharmacy’s expanding role in managing vaccines can ensure more thoughtful and thorough planning, coordination, and execution of seasonal influenza vaccination programs. Michael E. Klepser, PharmD, FCCP, is a professor of pharmacy at Ferris State University in Kalamazoo, Michigan. He received his pharmacy degree from the University of Michigan College of Pharmacy in 1992 and completed a pharmacy practice residency at Detroit Receiving Hospital and University Health Center, as well as a fellowship in infectious diseases at Hartford Hospital in Hartford, Connecticut. Michael is a member of the Society of Infectious Diseases Pharmacists, the American College of Clinical Pharmacy, and the Infectious Diseases Society of America. His research interests include rapid diagnostics, antifungal pharmacotherapy, antibacterial and antifungal pharmacokinetics/pharmacodynamics, influenza, and health economics. Stephanie Klepser, PharmD, has been the director of clinical services at the Kalamazoo Center for Medical Studies (KCMS) Pharmacy since January 2010. She earned her pharmacy degree with highest distinction from Ferris State University in 2007 and completed a post-graduate pharmacy practice (PGY1) residency at Northwestern Memorial Hospital, Chicago, Illinois. Stephanie is an active member of the Society of Infectious Diseases Pharmacists and has been involved with several research protocols evaluating innovative pharmacy models in the community setting, including the use of rapid diagnostic testing for diseases such as HIV, influenza, and group A streptococcus.